Note to users of this site: The images of museum collections featured here are subject to copyright and collection use policies and may not be reproduced. Individuals interested in using these images should contact the museums directly. Unknown maker. 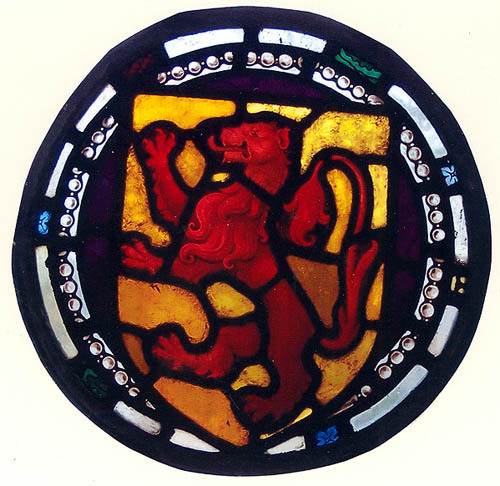 Stained glass panel - Lion, 17th century. Cranbrook Art Museum acc# CAM 1927.98. Photograph by William Gorski. Courtesy of Cranbrook Art Museum. According to the American Association of Museums, there are over 70 types of museums listed in their Official Museum Directory. There have been only two known attempts to count all the museums in the United States, with a most recent estimated figure of 17,500 museums1. Museums can be classified in various ways, such as by the material that they collect, the audiences they serve, and the manner in which they exhibit their collections2. In our attempts over the years to learn of stained glass holdings in the collections of Michigan museums, we found that the museums that tend to have stained glass in their collections or in their buildings fall into several sometimes overlapping categories: 1) Art museums; 2) College and university collections (including museums or historic buildings with stained glass under the care of colleges or universities); 3) Historic sites, usually former residences, now open to the public; 4) History museums and historical societies; and 5) Specialty and other museums3. Another category could include historic structures with stained glass such as churches or homes that have been rescued and repurposed by entities such as museums, universities or cultural centers. The stained glass collections in Michigan's museums and historic sites are varied in scope. While the state's larger art museums are well known for their collections of 13th-17th century European stained glass, our local history museums and academic institutions are full of surprises as well, including windows rescued from razed local churches and homes, works by Michigan artists, and even a few Tiffany windows. A number of local history museums and historical societies have taken up residence in former churches and other historic structures as well. It is important that before making a trip, visitors consider contacting museums in advance to determine hours and possible admission fees, as well as to see if any stained glass is on exhibit at the time. While historic sites like the Meyer May House in Grand Rapids obviously always maintain their windows in situ and the Detroit Institute of Arts is known for its long-term installations of stained glass, museums do not necessarily always have specific collections on display. Some museums may make arrangements to show collections to researchers by appointment, although policies will vary due to limitations in staff and for the protection of collections. 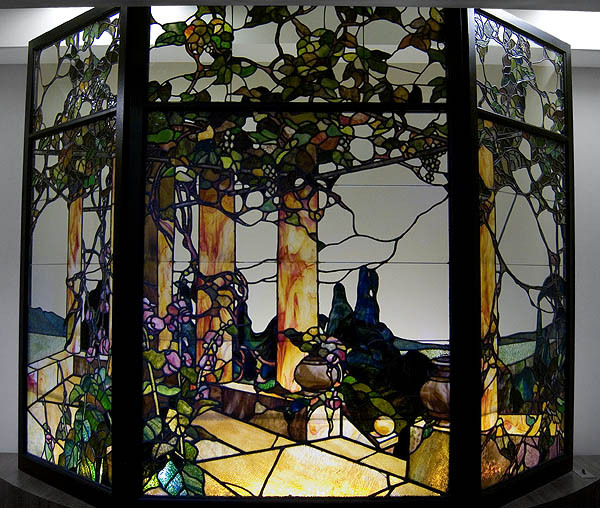 The first museums where one would expect to find stained glass would be in those with an interest in collecting art, and it is true that some of the most impressive stained glass to be found in Michigan can be found in our art museums. While the majority of the art museums in the state have at least one or two windows in their collections, the largest concentration of collections can be found in two southeast Michigan museums—the Detroit Institute of Arts and Cranbrook Museum of Art. The Cranbrook Museum of Bloomfield Hills is part of a larger entity of educational facilities developed in the 1920s by Detroit News publisher George Gough Booth, as an educational community that would "focus on the practical training and appreciation of a broad range of crafts." Located 25 miles north of Detroit, Cranbrook was named for the rural village of Cranbrook in Kent from where Booth's father had emigrated4. The Cranbrook collections encompass several buildings, including those of Cranbrook Art Museum, Cranbrook School, Brookside Lower School, Christ Church Cranbrook, and an Administration Building. Their collections range from 16th-18th century European pieces to an impressive array of early 20th century works by Charles Connick, Michael Healy, G. Owen Bonawit, Wilhelm Rupprecht and A. Kay Herbert5. Cranbrook's 17 early European holdings consist of primarily heraldic panels as well as two panels depicting the Nativity and Assumption of the Virgin. One 16th century Flemish allegorical panel is described in Tutag as the subject of the "Prodigal Son among Harlots"6. Booth acquired his panels from New York art dealer Grosvenor Thomas, who provided European stained glass to a number of affluent American homes, including the Edsel and Eleanor Ford House of Grosse Pointe7. Cranbrook's 20th century holdings include a number of prominent figures in the American and English Arts & Crafts movement: Two windows by Charles Connick, completed ca. 1924-25 depicting the subjects of "Fortitude of Job" and Saints Genevieve and Ursula of Cologne are replicas of windows Connick produced in 1921-22 for Harmony Grove Cemetery in Salem, MA and the Bishop's Private Chapel in the Episcopal Cathedral of Washington, DC8; a cinquefoil window by Irishman Michael Healy of "St. Patrick Lighting the Pascal Fire on the Hill of Slaine" was purchased by Connick in Dublin9; an unusual 1921-23 grouping of windows by German artist Wilhelm Rupprecht entitled "Scenes from the Book of Genesis: God divides the light from the darkness..."; and a large Christopher Columbus window made in 1927 by the G. Owen Bonawit Studios of New York. Cranbrook also recently acquired a dozen Frank Lloyd Wright windows, about which we hope to have more to report in the near future. The Detroit Institute of Arts (DIA) is probably best known for their extensive collection of over 60 examples of Medieval and Renaissance stained glass. Raguin describes this collection in no uncertain terms, as one of the finest stained glass collections in the country: "There is no more significant collection of stained glass in the United States outside of the east coast holdings at Metropolitan Museum of Art, New York, and the Pitcairn Collection, Glencairn, Pennsylvania. "10 The collection represents the 13th to 16th centuries from around Europe, with especially strong holdings in German glass from the 15th to 16th centuries11. A highlight to any visitor would be the 16th century chapel from the Château of Lannoy, Herbéviller, in Lorraine, France, which the museum acquired over the course of several years in the 1920s and opened in 192712. The chapel contains a grouping of late 15th century German windows depicting "Prophets and Psalmists After the 'Biblia Pauperum'" which was installed in a setting of grisaille strapwork created by the Willet Studios in 194713. The collection was acquired through various donations and art dealers both in the United States and abroad, occasionally funded through the museum's Founders Society. A number of the pieces were acquired from members of the Booth family, including George G. Booth, who had purchased a number of windows on a trip to Europe in 192214. Raguin notes that 20 works of stained glass at the DIA came from the large collection of publisher William Randolph Hearst, which was put on sale out of financial necessity in the 1940s. While the Hearst sale was not successful at the time, the DIA acquired the windows at a much later date, in 195815. 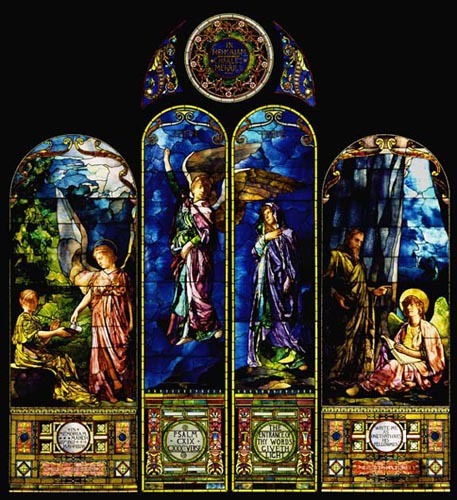 Given the strength of the DIA's holdings in stained glass, it is notable that when asked to name a representative example from the museum's collections, Curator James Tottis suggested not one of the museum's 67 European pieces, but a striking grouping of windows by John La Farge, noting that "they say stained glass in the biggest way at the DIA." This says much for the work of La Farge, which are significant as objets d'art as well as for their ties to local Detroit history. Removed from Detroit's First Unitarian Church when Woodward Avenue was widened in 1936, they are the only known La Farge windows in Michigan and among the best examples of opalescent-era glass that can be found anywhere in the state. The DIA also has windows and light fixtures by Frank Lloyd Wright, as well as a 1969 museum-commissioned window by artist Paul Bony, based on a cutout in the collections by Henri Matisse16. Left: Mathias Alten (American, 1871-1938). The Grape Arbor Window, 1906. Stained and leaded glass. 71 x 117 in. Anonymous gift in memory of Frank Vander Mark, 1992.9.1. Image courtesy of Grand Rapids Art Museum. German-born painter Mathias Alten lived and worked for years in the city of Grand Rapids, and his work was well known in Midwest17. MSGC 06.0019. Right: Abraham Rattner. Window, 1956-58. Flint Institute of Arts. Photograph by Barbara Krueger by Permission of Flint Institute of Arts. 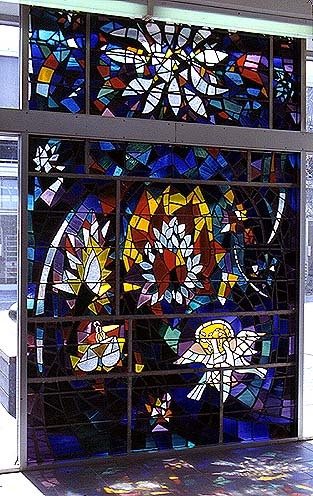 Other art museums in Michigan with stained glass in their collections include: The Grand Rapids Museum of Art, which has a stained glass window by painter Mathias Alten; the Flint Institute of Arts, which has a piece by artist Abraham Rattner and the Muskegon Museum of Art, which has a window by an unknown maker of Christ carrying the cross. Beyond stained glass, the Krasl Art Center in St. Joseph and Kalamazoo Institute of Arts have installations by well-known hot glass artist Dale Chihuly. Allegory for Education. Tom Woodruff in collaboration with Tom Blackburn and Pristine Glass of Grand Rapids, MI, 2000. Grand Valley State University, Richard M. Devos Center, Robert C. Pew Campus, Grand Rapids, MI. MSGC. 06.0005. Image courtesy of Grand Valley State Art Gallery. The college and university collections with stained glass holdings in Michigan vary, ranging from the traditional collections of places like Michigan State University (East Lansing) and the University of Michigan (Ann Arbor) to historic buildings with stained glass that have come into the possession of universities, such as Meadow Brook Hall (Oakland University, Rochester) and the Beecher Mansion (Wayne State University, Detroit). Each institution defines its "collections" differently as well, sometimes formally or informally including windows that are found in campus buildings. 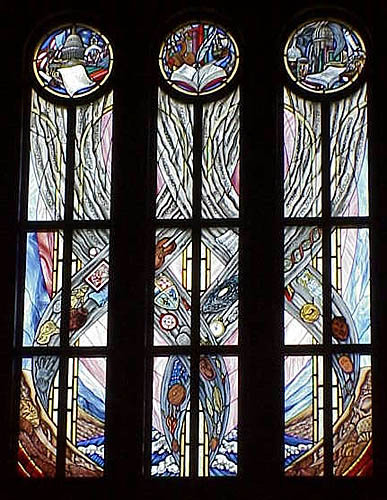 For instance, Michigan State University considers the windows of its Alumni Memorial Chapel to be part of its public art collections, although the structure is not under the auspice of either of the university's two collecting museums. Likewise, when the Michigan Stained Glass Census contacted Grand Valley State University in Grand Rapids to inquire about their potential collections, we were informed about the windows in the library at the Richard M. DeVos Center. Although there are other college and university facilities in the state that may have stained glass windows, the ones documented in this article have been specifically identified as part of a college/university museum/collection, or as historic sites in their own right. The museums of the University of Michigan in Ann Arbor (U of M) both have collections of interest in particular to scholars and admirers of Louis Comfort Tiffany. The University of Michigan Museum of Art can easily be described as a significant repository in the state of Tiffany-related decorative arts. While the collection includes three stained glass windows from the Henry O. Havemeyer House in New York (1890-91), they also have a number of other architectural items from the Havemeyer House including doors, a gilt metal/opalescent glass firescreen, and mosaic pieces. The U of M Museum of Art collection also has a number of Tiffany art glass objects such as vases and bowls18. In addition to its Tiffany holdings, The U of M Museum of Art has a portion of a 13th century rose window from Reims Cathedral of Notre Dame, France19 and a window by Frank Lloyd Wright. Like items in the DIA collection, the Wright window at U of M originated from the Darwin Martin House in Buffalo, NY (1904). The University of Michigan's other museum with stained glass, the Kelsey Museum of Ancient Archeology, has long been home to a Tiffany window. Once home to the campus Student Christian Association (YMCA), Newberry Hall became home to the university's archeological collections in 1945 but retained its 1889 "Fox Memorial Window" by the Tiffany Studios20. The Michigan State University Museum, in addition to being home of the Michigan Stained Glass Census, also has a growing collection of stained glass related objects and ephemera. While we have around two dozen stained glass windows and light fixtures dating from the late 19th century to the 1990s, the collection's strength lies in sizeable donations of cartoons, maquettes and other ephemera from Michigan artists and studios, including the Detroit Stained Glass Works, John VanderBurgh, Helene Rother and Vera Sattler. A recent donation of over 200 items related to the business of the Detroit Stained Glass Works includes windows, business correspondence, ledgers, artwork and other materials. Left: Maker unknown. 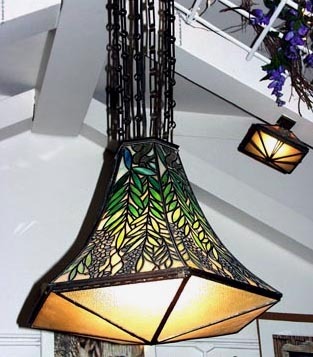 Stained glass hanging lamp, ca. 1900. This opalescent era light fixture and its eight matching sconces, currently hanging in the MSU Museum Store, are the only stained glass items on long-term display at the Museum. The lights, which were received through MSU School of Music, at one time hung in the music room of the Morley family of Saginaw, MI. MSUM acc# 2471. Photo by Pearl Yee Wong. Right: Maker unknown. 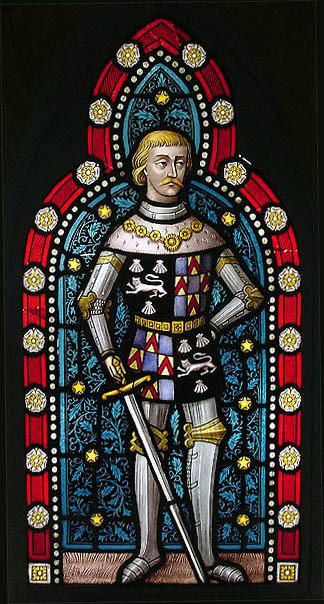 One of four stained glass windows each with the image of an armored Knight of the Crusades. Said to be from a private chapel in Barton Manor, Staffordshire, England. MSUM acc# 2009.103.2. Gift of Donna Boudemann. Photo by Val Berryman. Detroit Stained Glass Works. Cartoon, ca. 1927. MSUM acc# 7567.60. Gift of Marcia Carbone. The window associated with this cartoon of a mask was recently discovered at the Scripps Mansion in Lake Orion, MI. It is part of a large collection of cartoons, maquettes, business papers and other materials from the Detroit Stained Glass Works. 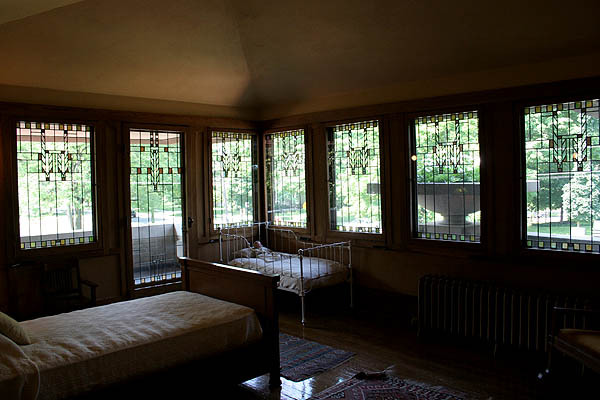 Left: Leaded casement windows in a child's bedroom bring the balcony view inside at Frank Lloyd Wright's Meyer May House in Grand Rapids. MSGC 95.0051. Photo by Pearl Yee Wong. Right: Ornamental window from the Whaley Historical House Museum in Flint. The 1850s structure was owned by several prominent Flint families before local lumberman and banker Robert J. Whaley purchased and remodeled it21. MSGC 96.0014. Photo by Charles Lowell. W. H. Wells & Co. and McCully & Miles, Chicago. Windows from the homes of Thomas Hume (left) and Charles H. Hackley (right), Muskegon, MI. 1888. MSGC 95.0061 & 95.0060. Photos courtesy of Messrs. Gager, McGlynn, Scarbrough, Willson and McCormick,Muskegon County Museum: Hackley & Hume Historic Site. Another historic site of interest is the 1888 Hackley and Hume Historic Site in Muskegon. Maintained by the Muskegon County Museum, the Hackley & Hume Historic Site includes the home of famous Muskegon lumber baron Charles H. Hackley, his partner Thomas Hume, and a carriage house, all with stained glass by the Wells Glass Company and McCully & Miles of Chicago. For those interested in Victorian glass in residential settings, the Hackley & Hume Historic Site has likely the largest amount of ornamental stained glass to see in one Michigan collection, with over 50 windows between the three buildings on site25. Other historic house sites around the state that have ornamental windows include the Voigt House Victorian Museum in Grand Rapids, the Honolulu House of Marshall and the Whaley Historical House Museum in Flint, among others. When the William H. Withington Home of Jackson was torn down in 1925 to make room for the local high school, its windows went into a private collection. The Ella Sharp Museum of Art and History received them in 1971. Tiffany Studios, New York. "SALVE" (hail) and "VALE" (farewell). Date unknown. Ella Sharp acc# 71.181. 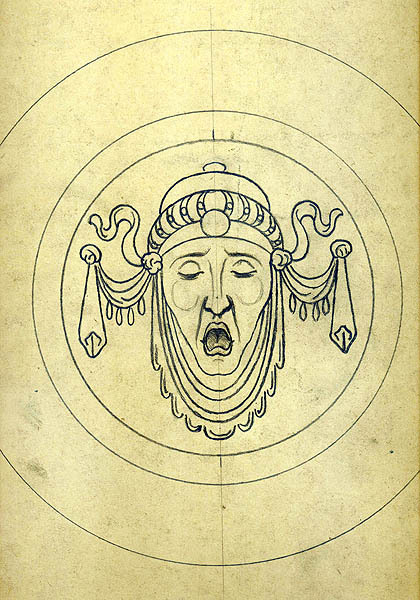 Images courtesy of Ella Sharp Museum of Art And History. MSGC 95.0056. Historical societies and museums are likewise important as collectors of stained glass for two reasons. First, many small museums and historical societies house themselves in former churches and historic homes that have period stained glass in situ. In many cases it is these museums that save these structures from meeting a fate of disrepair and destruction that is far too familiar. Additionally, local historical societies and museums are on the front lines of historical preservation in their own communities, and often become the repositories for stained glass when local historic structures are lost. While larger museums in other cities may have no interest in every window that comes out of a Michigan home or church, these windows become the showpieces of their local museums and historical societies, and maintain their histories for future generations. The Ella Sharp Museum of Art and History in Jackson possesses two of the state's lovelier Tiffany windows. The windows are a rare example as well, having originated from a Michigan residential setting. Removed from the General William H. Withington Home of Jackson (built 1882, demolished 1927), they depict two female figures and the Latin greetings of "SALVE" (hail) and "VALE" (farewell). The windows were installed on both sides of the door to the Withington Home26. The Detroit Historical Museum rescued windows by the D. H. Oidtmann Studios, as well as other architectural elements, from Immaculate Conception Church and St. John's Convent in Hamtramck, MI when the buildings were demolished in 1981. The loss of Immaculate Conception was part of the controversial destruction of the Poletown neighborhood, in which General Motors collaborated with the cities of Detroit and Hamtramck to build a new plant, displacing 4,200 residents and 140 businesses, as well as eliminating six churches27. Some of the windows reflect the parish's ethnic membership, such as a window of St. Hedwig, patron saint of Poland, and other windows with Polish inscriptions. These windows, along with other items in the Detroit Historical Museum's architectural collections, can be viewed on the museum's website. This type of resource is making the stained glass in Michigan's museums more widely accessible to the public. Other museums, including the Detroit Institute of Arts and University of Michigan Museum of Art have some of their stained glass collections viewable on the web, and an expanded stained glass collections website is under development at the Michigan State University Museum as well. Left: D. H. Oidtmann Studios, Linnich, Germany. St. Mary window, ca. 1920. 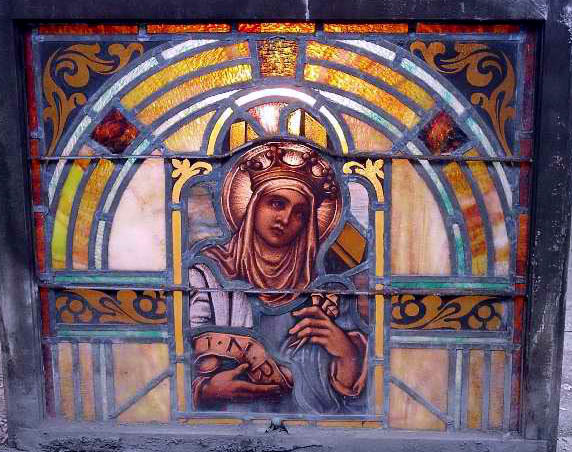 Eighteen stained glass windows made between 1919 and 1927 for Immaculate Conception Church in Hamtramck, MI were preserved in the Detroit Historical Museum's collections along with other architectural elements after the church was razed in 1981. Image courtesy of the Detroit Historical Museum. MSGC 06.0006. 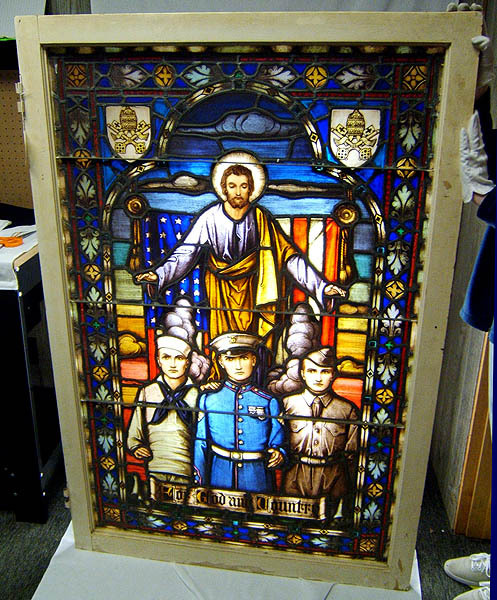 Right: The Muskegon County Museum has this window of Christ and American servicemen by an unknown maker, probably a World War I memorial, which was transplanted from a building in Italy. Muskegon County Museum acc# 99.080.1. Photo courtesy of Muskegon County Museum. MSGC 06.0022. There are a number of history museums all around Michigan from the large to small that may have one window, or two dozen windows, some as part of their original structure and others acquired from local donors. Many of the museums we have documented in Michigan reside in former churches, or maintain a church as part of an historic site complex. Just a few of Michigan's history museums with stained glass in their collections include: the Muskegon County Museum, which oversees the Hackley & Hume Historic Site, as well has having several church windows in its collections; the Old Depot Park Museum of Ironwood, which has several windows from razed local churches; and the Kalamazoo Valley Museum, which has an ornamental window grouping from the former Horace Peck Residence (the museum's former home). Left: G. Owen Bonawit Studios, New York. Knight window, 1929. Meadow Brook Hall, Oakland University, Rochester, MI. Photo courtesy of Meadow Brook Hall Program Guild. MSGC 96.0067. Right: Maker unknown. 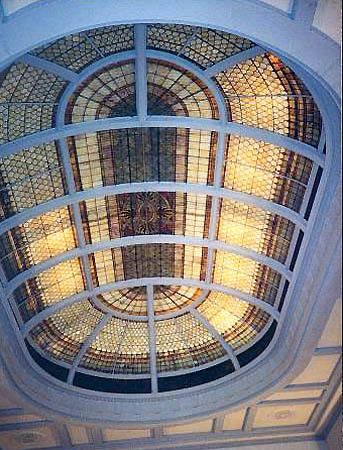 Stained glass dome, First Church of Christ, Scientist, Kalamazoo, MI (1913, William C. Jones, Chicago, architect). Photo by Lawrence B. Schlack. MSGC 97.0049. As we have seen, museums, universities, and other cultural institutions often assume stewardship of former churches, historic homes, and other structures, allowing us access we might not otherwise have. About one third of the museums we know of in Michigan that possess stained glass are museums residing in historic structures, or such buildings have come into the possession of museums or universities for uses other than they were originally intended. Meadow Brook Hall of Rochester, once home to automobile pioneer John Dodge's widow Mathilda Dodge Wilson and her husband Alfred G. Wilson, began its second life after Mrs. Wilson donated it to Michigan State University in 1957 with a gift of 2 million dollars for the formation of a new university. Now part of Oakland University, the 1920s Neo-Tudor structure is used as a university conference and cultural center28. We have learned in recent months that the recently disbanded Ladies Literary Club of Grand Rapids donated its historic 1887 building (with its striking Shakespeare Tiffany window) to Calvin College29. Likewise the Kalamazoo Institute of Arts recently purchased the distinctive 1913 domed First Church of Christ, Scientist, and will announce its plans for the structure in the near future30. The museums, university collections and historic sites listed here represent our knowledge to date of stained glass in Michigan collections that we know of at this time. While much of the information was provided by our volunteer census takers or through our own research, we are also thankful to the staff of the various museums who provided us information on their collections both through direct registration of their buildings and as a result of a Michigan Museums Documentation Project we conducted in 2006. We also would like to express thanks to the museums for the use of images of the windows in their collections. If you know of additional Michigan museums or historic sites with stained glass collections that are not included here, please contact us. 1American Association of Museums. "Museums FAQ" (2007). 2Ambrose, Tim and Crispin Paine. Museum Basics. New York : Routledge, 2006, p. 6. 3These museums could include such places as the Bruekner Museum (Albion), which serves the Starr Commonwealth, a service organization for troubled youth, or the U.S. National Ski Hall of Fame and Museum (Ishpeming). 4Raguin, Virginia Chieffo and Helen Jackson Zakin, with contributions from Elizabeth Carson Pastan. Stained Glass before 1700 in the Collections of the Midwest States. London : Harvey Miller Publishers for Corpus Vitrearum Inc., c2001, 2:48. 5The Herbert windows are located in Brookside School. Christ Church has windows by Wright Goodhue, New York; Nicola d'Ascenzo, Philadelphia; James H. Hogan/James Powell & Sons (Whitefriars) Ltd., London; J. Gordon Guthrie; R. Toland Wright, Cleveland, OH; G. Owen Bonawit, New York; A. Kay Herbert, Detroit; and one window reportedly from a cathedral at Amiens, France. Michigan Stained Glass Census file 94.0158, Michigan State University Museum, East Lansing, MI. 6Tutag, Nola Huse with Lucy Hamilton. Discovering Stained Glass in Detroit. Detroit: Wayne State University Press, 1987, p. 131. 9ibid., 2: 21. Raguin dates the window at 1914; museum records date it as ca. 1925. 10ibid., 1:145. The collection is well documented in Stained Glass Before 1700 in the Collections of the Midwest States, as are all the works at Cranbrook, the Edsel & Eleanor Ford House, and the University of Michigan Museum of Art. 18Some of the the UMMA collection's pieces can be seen in Johnson, Marilynn et al., Louis Comfort Tiffany: Artist for the Ages. London: Scala, 2005. 20Truettner, Julie. "The Kelsey's Fox Memorial Window by the Tiffany Glass Company," The Kelsey Museum Newsletter, Spring 1992. http://www.lsa.umich.edu/kelsey/research/Publications/spring2002/tiffany.html. 21Ashlee, Laura Rose, ed. Traveling Through Time: A Guide to Michigan's Historical Markers. Ann Arbor: University of Michigan Press, c2005, p. 133. 22Raguin et al, 2:52; Bridenstine, James A. Edsel & Eleanor Ford House. Grosse Pointe Shores, MI: Edsel & Eleanor Ford House, c1988, pp. 11-13. 25Michigan Stained Glass Census files 95.0060, 95.0061 and 95.0062, Michigan State University Museum, East Lansing, MI. 26Michigan Stained Glass Census file 95.0056, Michigan State University Museum, East Lansing, MI. 27Nolan, Jenny. "Auto Plant vs. Neighborhood: The Poletown Battle" ( 2007)The Detroit News Rearview Mirror. Detroitnews.com. 28Eckert, Kathryn Bishop. Buildings of Michigan. New York: Oxford University Press, 1993, pp. 161-2. 29Slager, Emma. "LLC Hands Calvin Key to its History." Chimes, 16 February, 2007. 30MiBiz.com. "KIA Assumes Ownership of Historic Church" (18 September, 2006). Text by Michele Beltran, Michigan Stained Glass Census, September , 2007.